Had my first venture out with the BOSS outriggers yesterday, very pleasant. It was a blustery day, overcast, cool and I felt like sailing. So it was a perfect day to break in the BOSS system. 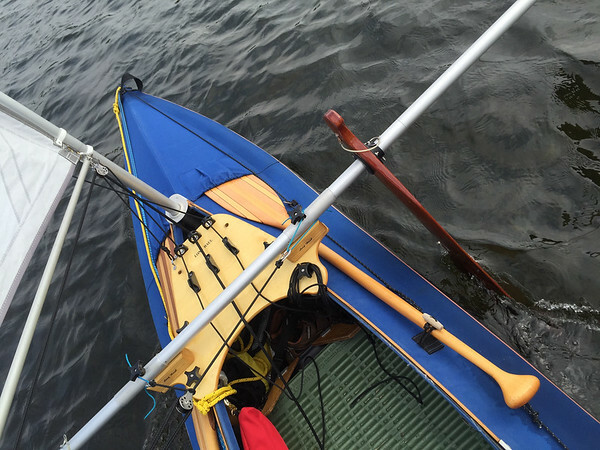 I'd been thinking about rigging the AEII on the water and that was my plan; but when I got down to the lake the wind was so strong I would have ended up in the weeds before I was ready to sail so I opted for rigging in the boat while tied to the dock. This proved difficult. Reaching around and inserting the aka tubes together wasn't much of a problem, but getting the locking pin through the leeboard collar and aka extension was. The top hole was easy enough, but getting the pin through the bottom hole came with more than a few expletives and the desire for a hammer. Putting the port side together would have been pretty straightforward if I wasn't constantly being blown back into the dock. While I'm on the subject I'll mention that at the end of my sail I tried to remove the aka extensions while sitting in the boat (and beached) without success on the leeboard side. This needs to be worked on. Semi-real rigging on the water. Setting up the sail and getting underway was pretty easy once I had the outrigger in place. Eventually I discovered that standing in the boat is very easy with a little bit of forward motion. 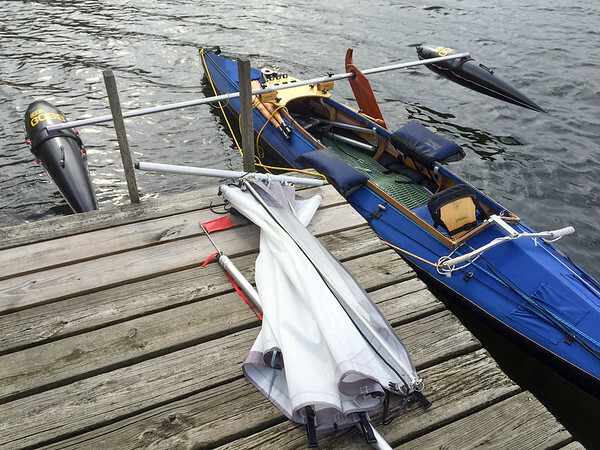 The outriggers make the boat very stable. 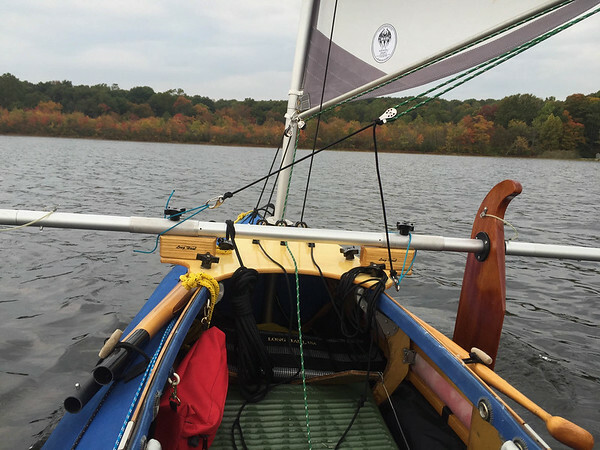 With the 36 HP BSD mounted in the Klepper mast hole and the aka with leeboard about 14 inches abaft gives the boat a somewhat consistent weather helm. I was able to goof around tying lines, moving my hike-out seats back, and stuff like that while just letting the boat sail itself. Left alone on a mild port tack the boat would slowly move towards the weather until it flopped over into a starboard tack, then slowly reverse itself back to port gradually nudging itself forward all the while. The rudder was down and the breeze pretty consistent around 10 mph. With the rudder up the weather helm was less consistent and my position in the cockpit seemed to make a difference as to what the helm would do. Overall a very steady, comfortable sailing experience. I got the rig going pretty fast a couple times and if you don't get those amas out of the water they are certainly pushing some water. But it's not as if the boat suddenly leaps forward a few mph when the ama comes up; the ride feels cleaner and the sound of the ama splashing it's way along suddenly stops. If there is a speed increase with the amas up it's a gradual increase. With the Long Haul BOSS mounting board my akas are elevated about four inches above the coaming. On an even keel I think the amas are between 8-10 inches above the water. 10 inches above the water maybe? I was again having problems with the battens sticking to one side or the other between tacks. When I tried dropping the sail and it wouldn't come down. 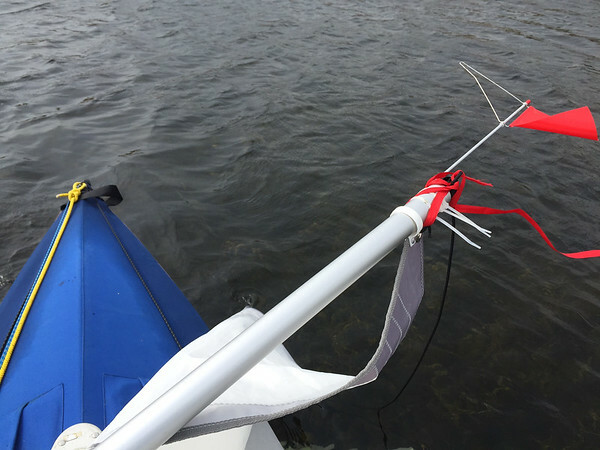 My ribbon wind indicator had wrapped itself around the halyard and essentially tied the sail in the 'up' position. Hmmm, that's not smart. So, out on the water I pulled the entire mast out with the extended sail, laid it across the boat and untangled the ribbon mess. This removal and lowering of the mast and sail together was surprisingly easy to do. I think maybe the wind helped by floating it all down... it was kinda weird. Overall I enjoyed the BOSS system quite a bit. I still like sailing without but this was an equally enjoyable outing. Last edited by DLee on Sat Oct 10, 2015 11:05 pm, edited 1 time in total. A few more thoughts and ramblings... and please keep in mind that I was on a pretty small lake with no wave action. I wonder if my rig experiences a little less of the ama drag with the aka mounted further forward and slightly higher? I know that often this rig is placed more in the center of the boat. I was pretty happy with the forward sail position. The cockpit remains wide open and I like the way the boat handled. I don't think I'll consider changing that. Leaning out vs. hiking out. In an effort to experience the difference between amas in the water and out, I balanced the boat as much as possible while sailing. As noted above it was hard to tell a difference. There's no doubt in my mind that the boat would go faster without the ama dragging, but it's a slow change. The surprising difference was countering the lean. I tried two methods; one leaning from the standard paddling position and the other using the hike-out seats. From the seated position I needed to get almost my entire torso out and over the gunnel to bring the leeward ama up on a strong run. To the point where my hips were almost resting on the coaming. On the other hand, sitting up on the hike-out seat was almost too much for the outrigger system. I found myself leaning inboard as much as sitting upright to balance the rig. Only once or twice did I get the opportunity to actually lean out a bit to balance the rig, and that was in a pretty strong blow. When sailing without the outrigger there is a much greater area of lean that you can play with. From allowing the sponson to dip well into the water to trying to keep the boat on an even keel, there's a substantial comfort range that you can work with while on the hike-out seat . With the outrigger it's a very narrow window of balance. I found myself putting the windward ama down more often than I would have liked. So the efficiency factor of countering the lean from the sitting position in the bottom of the boat is very very low. I'm pretty sure that just being up on your knees would make a huge difference, but I can't remember doing that comparison yesterday. I was often surprised by how much wind was blowing and how slowly I was moving. There were a couple times when I truly did HAUL A$$, but a lot of the time I was really struggling to find the speediest angle of attack, often it just didn't happen. That probably says more about me as a sailer than the sail... but I still found it a little frustrating. That said, the sail is efficient, there's no doubt about that. It works well and unless you are hit by a gust, there are few surprises. Downwind it's a handful though. I don't recommend any type of straight downwind sailing with this sail without the outrigger. Capsize is imminent. I still need to work out a good main sheet system. This quick rig actually worked fine, but I don't think there's any need for the wishbone. The leeboard seems great, very happy with that. Again, I really loved the amount of space I have in the cockpit, and with the outriggers set up I didn't even think about balance if I didn't want to. Just sit back and let her go. Pretty thoroughly relaxing I gotta say. 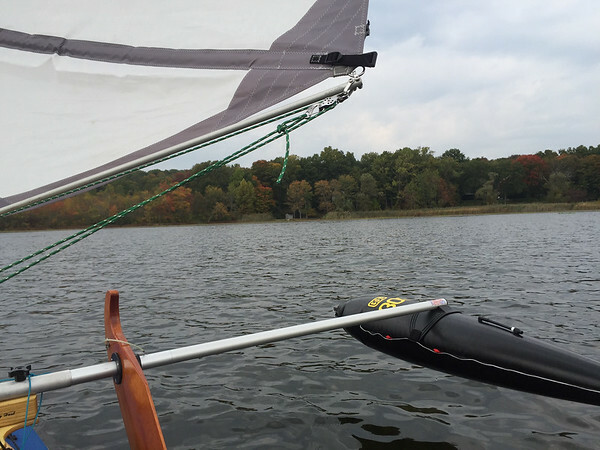 With Mark's BOSS mounting board it's literally been plug-n-play with this Balogh sail rig. How can you not love that? I never really thought I'd be here with this rig, but now that I am, I like it. getting the locking pin through the leeboard collar and aka extension was. The top hole was easy enough, but getting the pin through the bottom hole came with more than a few expletives and the desire for a hammer. A hammer, or a convenient rock, has definitely been used! I'm very interested to hear your observations, particularly about sailing with ama in vs. out of the water. I felt that it was different, but I had crew that was hiked out (and I don't get to sail my boat nearly as often as you do yours-- only once this year ). I haven't sailed my rig with only the single sail in a decade. I feel it goes nicely downwind, though-- wing-and-wing and leeboard up. Yes, with the BOSS outrigger, you definitely do not need the hiking seats, nor the hand tiller. Use the rear cockpit seat position, reinstall your foot controls, relax, and enjoy a safe sail in almost any winds. I have found that the drag from the amas that so many people talk about is really very small with the BOSS amas, with the way they are shaped. And in really strong wind conditions, you would really have to hike out a lot to keep both amas out of the water. In low wind conditions, up to about 8 mph, sitting on the hiking seats seems unecessary; you're better staying in the seat and leaning port or starboard to keep both amas out of the water. 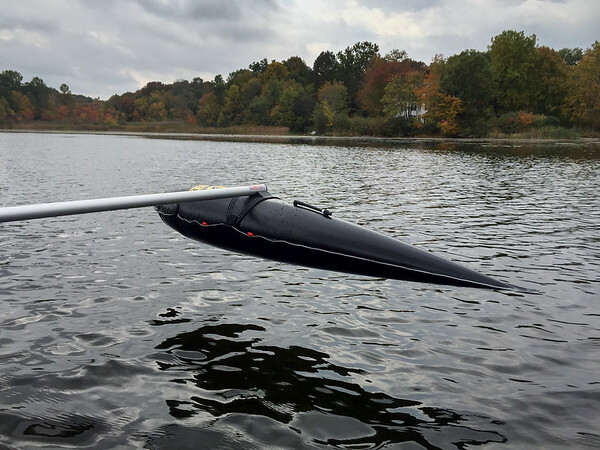 You only need the hiking seats and hand tiller if you want to sail without an outrigger, or with undersized ones like Spring Creek, Hobie, Harmony, etc. in moderate to strong winds. And if you are sailing in such conditions alone, unless you add tiller extentions to both sides of the hand tiller, you need to have the hiking seat a lot closer to the tiller than you have set up, in order to be able hike out and steer at the same time. Although I bought a conventional old Klepper hiking seat and hand tiller, I have never used them, or needed them when using the BOSS outrigger. And the hand tiller needs a lot more conscious attention than the foot peddles. It's true that the hand tiller requires a little more attention than the foot peddles. The foot steering is so natural it makes one wonder why we don't steer our cars that way, ha. Mark at Long Haul has a line system for steering that he demonstrates in one of his videos. It's a pretty good idea and I might incorporate some form of that when using the outriggers. I have my boat set up with a sailing board so that I can move around in comfort. This means the foot peddles stay up front and generally don't get used unless I'm doing some rigging and need to adjust the course while forward in the cockpit. I have an anchor trolly system that my hand tiller extension can be clipped to and it acts as a very basic steering control. This system allowed me to move the hike-out seats to the rear of the cockpit in a fairly prolonged process while underway. I have to say that the outriggers make it an entirely different kind of sailing experience. Having the wide open cockpit is great and I can set my Long Haul comfort seat anywhere that's comfortable. So I'll probably keep using the hand tiller and extension. The hike-out seats are nice to have as well as they make very comfortable arm rests, I felt downright decadent sitting in my plush arm chair in the back of the Klepper, ha. If the breeze picks up sitting on the rail is a ton of fun. Although you don't get to lean much with the BOSS keeping watch. I'll keep them onboard, I enjoy them, and who knows, I may eventually figure out a way to get the outriggers off while out on the water for some BOSS-less fun. I'm tempted to agree with you that the BOSS amas don't affect speed that much. But I wouldn't be surprised if we found another knot + giving the boat a little time to pick up the pace. I hope to make a test of that one of these days and see what the GPS says. You might try this test as well out there. Consistent wind seems to be the key. Consistent results will determine the test right? I can't fault this Balogh system at all really. It works as a unit and all the parts work well independently. I successfully sailed the 36HP without outriggers to great pleasure. The leeboard works great. The BOSS outrigger is stable as can be. It's easy to stand for as long as you like in the boat. Like you Chris, I'll be trying out the S2 sail set with the BOSS rig as well. Overall a very versatile package. I'm quite pleased.